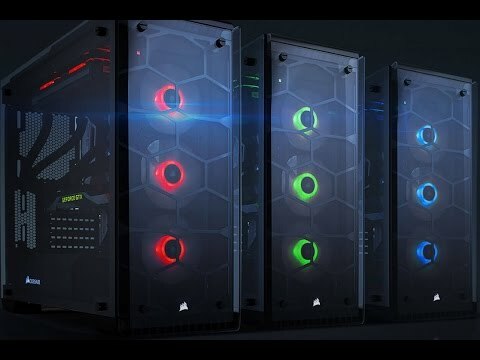 Corsair Crystal Series 570X RGB Mid Tower Computer Chassis, ATX/mATX/mITX, Tempered Glass, 3x120mm RGB Fan is rated 4.5 out of 5 by 6. Rated 4 out of 5 by Scotsy from A few flaws but beautiful case I bought this case for my latest build about 2 years ago, so it's had plenty of use and abuse since then. I have 2 major issues with the case: 1. PSU shroud - the smaller 460x and 460c versions of this case have a full PSU shroud to hide all those messy cables, the bigger, more expensive 570x does not - what gives? the bottom of my case looks like a plate of spaghetti. Along with this, there's no space between the end of an ATX mobo and the shroud, so I/O inputs are left to sit along the top of the shroud and it looks untidy. 2. There's a cable management cover on the back side to hide away larger cables such as mobo power, SATA, etc and it's far too small. I had to put nearly my entire bodyweight on it and get someone else to screw it shut. Other than that, the case is quite nice looking, easy to clean, a good size for a mid-tower. SSDs and HDDs fit neatly in the back but in such a way that it can be a real stretch to fit SATA power to everything because of the way the cables have to lay to not look like a mess, or press to hard against the glass. Rated 5 out of 5 by BOM8ER from Amazing all round case Very good looking and very easy to work on, even for custom loops. Rated 5 out of 5 by Charlie13 from A stunning enthusiast case This case is easy to build in and easy to access, due to the 4 thumbscrews securing the glass to the case. The tempered glass panels are slightly smoked, but allow enough light through for you to still see your components. The case has welcome cable management features, like a metal bar, which conceals the rubber grommets from the right-hand side of the case, and cable tie anchors all around the perimeter of the ,motherboard tray. Rated 3 out of 5 by Sammaye from So good yet, so bad This case is amazing looking, no doubt about it. But in their haste to get a tempered glass case out Corsair has rushed and created a case which has less features than a £20 case from Ebay. There is no HDD light, no reset button, you cannot remove the PSU cover, the fans are not PWM, cleaning the case is very difficult, the magnetic filters need more magnets in the right places and overall, unless you are a showboat who cares more that people can see how egotistical you are, this case is kind of worthless. Really great concept but poorly implemented. Is it possible to fit a Blu-ray player in this chassis? How many ports on lighting controller? How many ports are on the lighting controller, and are they compatible with the HD140 RGB Fans also from Corsair?